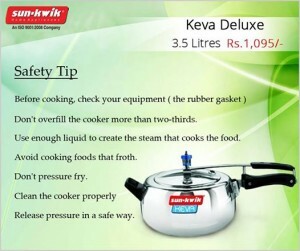 Pressure cooker is an integral part of any modern kitchen. When you are rushing for office or preparing your kids for school you need to cook as early as possible. On the other hand you cannot ignore the health factor anyway. The only thing that will come to help you out in such situation is a pressure cooker. To cook fast and retain health all at the same time become possible because of this equipment. Moreover, the companies in the country like Hawkings, Prestige and Sunkwik are coming up with various types of pressure cookers like keva pressure cooker, induction based pressure cooker to make cooking more hassle free. It not only makes cooking fast, cookers have some other benefits too. Take a look to know more about it. The biggest benefit of pressure cooker is it saves a lot of time and energy, indirectly money as well. If you are cooking chicken in an open pot then you are going to waste a huge amount of energy. Not only that, the food value and nutrients will get wasted because of the steam. But in pressure cooker heat and steam remains inside that makes cooking a fast affair. If you are opting to cook and feed your family healthy then pressure cooker is the best thing that can serve the purpose. Pressure cooking requires less water than the other cooking methods that results in retaining vitamins and minerals of the food. If you are tired and furious after cooking in a heated kitchen for hours, then it is time, switch to pressure cooking. Stove top cooking releases too much of heat and steam. It makes the whole atmosphere hot and sultry. Pressure cooker can save you from that trouble too. It helps to maintain the clean and cool atmosphere that will make you able to cook for as long as you want without getting too much exhausted. Find the right model of pressure cooker for your family. Eat healthy, stay healthy.